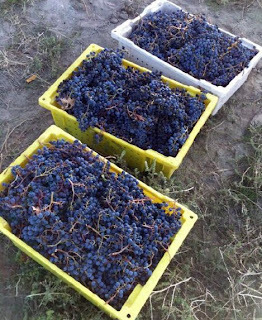 The 2010 Harvest is underway in Washington State. Over the coming weeks, I will provide weekly updates on what is picked, where, and when. See previous reports here. Flavor development being ahead of sugar development has been somewhat difficult for many of the state’s newer winemakers. Kent Waliser of Sagemoor Vineyards says: “What is very obvious is winemaker confusion. The standard recipes aren’t working so they are going to have to make wine. It is fun to watch.” Eric Murphy says this has also lead to some interesting numbers for the grapes. “An interesting trend in the last 1.5 weeks is a disproportionate drop in TA numbers vs. Brix/pH rise. TA is dropping by 1g/L with pH hardly moving and Brix increases of 1-1.5 degrees,” Murphy says. One concern about the delayed and potentially compressed harvest is that a large amount of fruit may come in during a short period of time. For Washington’s numerous small wineries that have limited space and equipment, this presents a potential challenge (in addition to many long nights). One winemaker joked that this will be the “year of the pick bin,” with bins pressed into action to double as fermenters. In terms of weather, several locations in eastern Washington saw rain on Thursday 9/23 with rumors of hail in some spots. None of the people I spoke with expressed concern about the rain. Some do have concerns of noble rot (and some are looking forward to it!) and some have concern of not so noble rot. The information in the table below is aggregated from personal correspondence with growers and winemakers, as well as information posted on Twitter and Facebook. It is not intended to be comprehensive but rather is intended as a snapshot of what is going on around the state. If you wish to send data for your grapes or vineyards (or correct any of the information below), please email me at wawinereport@gmail.com, leave a comment below, or leave a comment on the WWR Facebook page. First picture courtesy of Lawrence Vineyards. Second picture courtesy of Ryan Johnson of Grand Reve Vineyard showing the first (legal) harvesting of fruit. 23.5 brix with a pH of 3.54. Wonderful acidity and excellent flavors. Latest ever begun crush. All exceptional and low brix. Finish harvesting Merlot 9/27. Probably average 24 Brix. Cabernet and Malbec around 23+. 23.5 Brix. Really happy with the juice flavor. Harvesting just beginning this week. Harvesting to be completed this week.